Open Letter To Donald Trump | Cutting Edge Strategy to Help President Trump Defeat America's Enemies & Make America Great Again . . .
To President Trump and Visitors: First read the article immediately below on Stopping Democrats from being put in charge of Congress in 2018 by Computer VoteFraud; 2nd, read “New Open Letter 2018” menu tab on courses of action to create historic Trump Presidency, Third, read our most recent News Posts by date below. Trump Must Spotlight Computer Votefraud in 2018! Click Here! 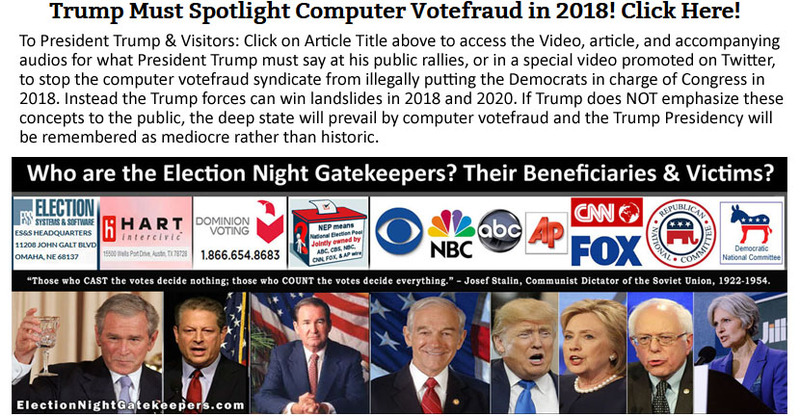 Click on the photo below to go to the website electionightgatekeepers.com which exposes the 12 mega entities (computer votefraud syndicate) that are stealing and/or altering so many of our key elections. Three Supreme Court Decision have ruled emphatically that your right to vote consists of TWO parts: 1) the Right to cast a ballot, i.e., put a paper ballot into a ballot box; and, 2) Right to KNOW that your vote was counted accurately. Mr. Trump, if you do not deal with the election votefraud problem now, you will surely “lose”. If you deal with the election votefraud issue in the Iowa Caucus, then you will be on the road to the White House. If after the Iowa Caucus you also deal with the much more serious election votefraud issues in NH, SC, and beyond, then you have an excellent chance to become President of the United States of America. 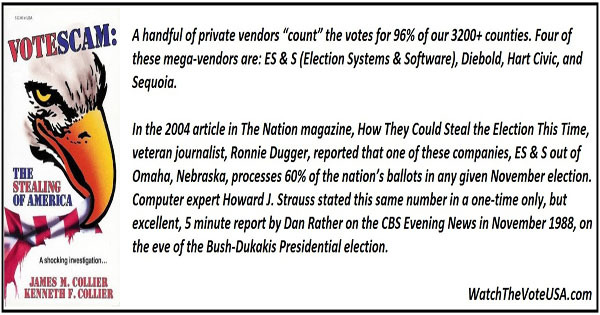 (Please note the graphic below was made ten years ago, and demonstrates the essence of the problem of trusting our elections to a handful of private mega-vendors. In recent years a company named Dominion has bought Diebold and Sequoia. This “musical chairs” of names, owners, and locations has been going on for 40 years, since the dawn of computerized elections. Many astute observers believe that the ownership basically remains with the same crowd, the dark side of certain Intelligence agencies and a handful of International Banks, despite all the surface window dressing. You can order the original print edition of Votescam: the Stealing of America by the late Collier Brothers, or a new ebook version updated by Victoria Collier.) Near the beginning of this Presidential Campaign you said that you “whine, and whine, and whine until I win”. Now is the time to “whine” about past documented election fraud in the Iowa Caucus perpetrated by the Iowa GOP State HQ, and the illegal, unconstitutional and criminal computerized “vote-counting” system that has been imposed on the American people since 1988. However, it is clearly NOT whining to ask in advance for a FAIR, TRANSPARENT & CONSTITUTIONAL vote count! In fact, if a candidate is going to ask for time and support from his fellow Americans, is it not his duty to demand for them a transparent, honest vote count? Before computers were introduced into elections in the 1970’s, everyone knew that it was an essential part of every campaign to Watch the Vote count. Every worthwhile campaign handbook in history carries a prominent section on the necessity of making every effort to prevent vote fraud on election day. In his classic 1964 book, “How to Win an Election”, Barry Goldwater’s Senate Campaign Manager, Stephen Shadegg, emphasized the necessity of ballot security. In Chapter 14, entitled, “Don’t Let Them Steal it From You”, Shadegg admonishes all future campaigns: “This being an imperfect world, populated by imperfect men, it would be naive to expect that man’s sinful greed which prompts him to steal, lie, cheat and wage war would be submerged or held in check when the contest is for a political prize . . . To insure an honest vote and an honest count, observers, supported by all contending factions, should police the activities in the polling place from the moment the doors open until the last ballot is counted.” While citizens can still watch the vote in the Iowa Caucus process, and in the ten smallest counties in NH which means only 20% of the NH vote, the Votescam Syndicate has made it impossible to observe anything in South Carolina and the primaries beyond, where elections have been computerized. This must be reversed if America is to remain at all free. This is not a complicated subject, nor does one have to understand all the ins and outs of this issue, or understand computers. All the American citizen has to know is that a powerful group of people have worked stealthily for decades to arrange things so that they can count our votes in secret. When someone wants to count your votes in secret, you know they are up to no good. Anyone in the 49 states, and in the ten largest counties in New Hampshire, can confirm with a simple phone call to their county Board of Elections that citizens, candidates, and local press people will be arrested if they try to see and/or count any ballots on election day in November, or in any of the primary states in the spring/summer primaries. The ballots are whisked away from the people at closing time and “counted” behind closed doors, and behind police guard, on computer programs which have been programmed by persons unknown, with the officials at your Board of Elections FORBIDDEN BY THE CONTRACTS THEY SIGNED WITH ONE OF A HANDFUL OF MEGA-VENDORS to examine the source code that is telling the election computers what to do on election night. 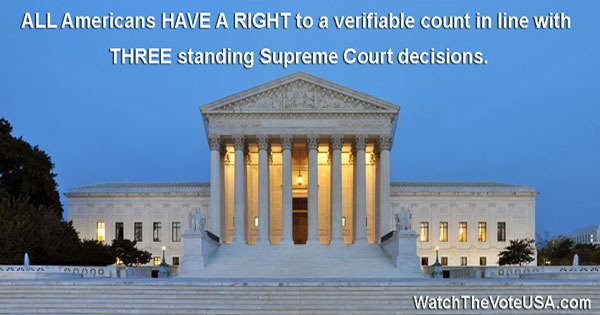 ALL Americans HAVE A RIGHT to a verifiable and transparent count in line with THREE standing Supreme Court decisions. One of those US Supreme Court decisions, Westbury v. Sanders, 1964, stated that all other rights, even the most basic, are illusory if the right to vote is undermined. The other two relevant US Supreme Court decisions, namely, US v Mosley (1915) and Reynolds v Sims (1964) say that our right to vote consists of two parts: a) the right to cast a ballot; b) the right to KNOW that our vote has been counted accurately. There is an avalanche of documentation to backup the Watch the Vote effort. 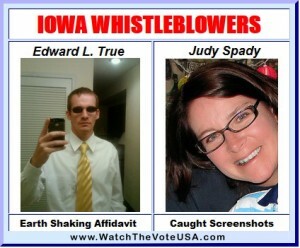 To examine this evidence, please click here: EXPOSING THE VOTESCAM SYNDICATE. Paraphrase from the movie, Braveheart: “Help Us All, Mr. Trump. For Heaven’s Sake, Help Yourself! Our suggestion to you, Mr. Trump, is — after reading this website, watching the two CNN videos, and the other short videos, — consider TWEETING out to your millions of followers to go to www.OpenLetterToDonaldTrump.com so they can evaluate this information. We promise that you will be surprised at the explosion of support that will follow from Everyday Americans. The public will overwhelmingly support you, and thank you, for raising this “votescam” election fraud issue. The Big Media will have nothing to say, as they have depended on staying in the shadows on this issue, and are up to their necks in enabling computerized election fraud since the 1970s. When the Votescam issue is exposed, GOP primary voters will suddenly realize how we got McCain in 2008 and Romney in 2012 as the GOP nominees. And Obama again in November 2012. The answer in all three cases: easily-rigged computerized elections where tens of thousands (or millions) of votes can be switched silently in the blink of an eye. Please alert the media that, due to the fact that the Iowa GOP State HQ announced THE WRONG WINNER on Iowa Caucus night 2012, you are directing your supporters to watch the vote at their local caucus on Feb. 1. And then direct your supporters in Iowa to plan on taking a cell phone picture of the Official Tally Sheet at their local Caucus gathering, and then emailing that picture to Watch The Vote at WatchTheVote2016@gmail.com where our volunteers will post the pictures on our public website, making it impossible for the Iowa State GOP, or anyone else, to falsify the Iowa Caucus Vote in 2016. If you would rather erect your own website as part of your Presidential campaign to accept these cell phone pictures of the official tally sheets on Feb. 1, we will tell your designated tech people how to erect such a website quickly and, of course, at no charge. We don’t want your money, we want a fair and honest count for Donald Trump, and everybody else. (The same offer is extended to Rand Paul, Ted Cruz, Ben Carson, and every other Presidential candidate. ALL campaigns should be effectively watching the vote on the night of the Iowa Caucus 2016.) Secondly, and just as important, begin preparing to sue the Secretary of State in NH, SC, and the subsequent primary states for conducting illegal, unconstitutional computerized elections. The lawsuit would demand open, transparent, constitutional vote counting in all future elections, primaries, and Caucuses. In the ten largest counties in NH where secret computer counts are held, the NH Secretary of State is not only violating the three standing US Supreme Court decisions explained above, but is also violating New Hampshire state law which requires open, transparent vote counts, and forbids secret election counts. Computer election counts, by definition, are secret counts. In South Carolina, the election process is even more of an insult to every thinking person, if that be possible. In SC, there are no paper ballots! Every “vote” is merely a bleep of energy! (Ha! Ha!) The Secretary of State of South Carolina is also violating both the three standing US Supreme Court decisions AND South Carolina state law. See the 2008 ten minute Youtube video “South Carolina, Super Tuesday, and Ron Paul” for a thorough explanation of this aggressive election law-breaking in South Carolina. The exact strategy for stopping the votefraud planned for you in the Iowa Caucus, the New Hampshire Primary, and beyond, is explained at the pages for Iowa and NH linked on the top menu. Disclaimer: Big Media and others who might be of bad will: This letter is TO Donald Trump, and to his supporters and all honest Americans. This Open Letter is NOT by Donald Trump. As of October 31, 2015, when this Open Letter was launched, none of us connected with Watch the Vote 2012 (now 2016) have ever met Mr. Trump, or any of his family, or any of his close associates. This “Open Letter to Donald Trump” is totally our initiative without Mr. Trump’s prior knowledge, and none of its contents can be fairly attributed to him, although we believe this letter contains information that ALL sincere, honest Americans will be glad to be aware of. Below is the 2 min version of the video “40 Seconds to Victory for Trump” – which was what we were suggesting Mr. Trump say in his final speeches in the 2016 Presidential Campaign. He accomplished the same thing with his tweet on the night of October 26, 2016 about how touch screen computers were switching votes right before each voter’s eyes from Trump to Hillary Clinton in Texas, Maryland, Colorado and elsewhere – and — with the answer he gave to Chris Wallace of Fox News in the 2nd last question of the third debate. Wallace’s question was: “Will you accept the election results?” Mr. Trump said (paraphrase): “I’ll wait and look at the evidence; I’ll keep you in suspense.” Still, listening to this two minute version below may be useful for many visitors.